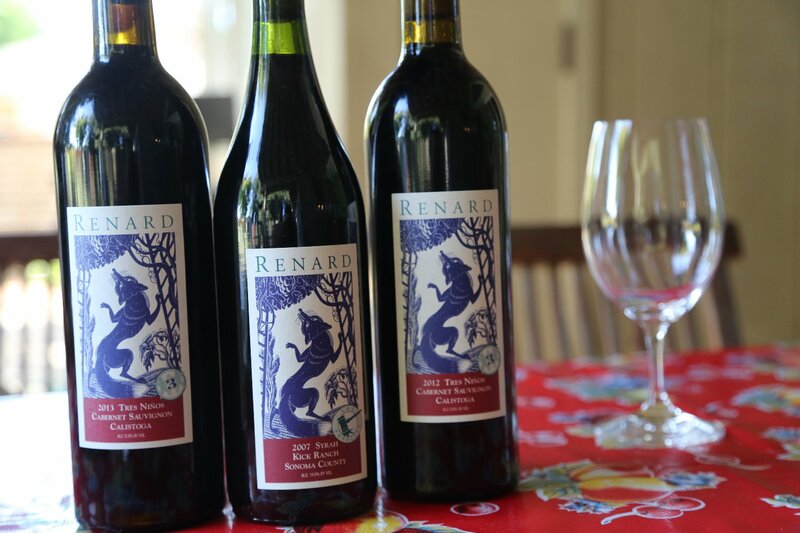 Renard Wines (Renard means fox in French) is owned by long time wine veteran Bayard Fox and his wife Sharon Parham. Bayard is the winemaker and has lived in the Napa Valley since 1990 and Sharon designs the labels. Bayard was born in France and has a connection to French styled wines; today he works for a French Cooper and is able to visit France from time to time and he also worked a harvest there early on in his career. Renard used to focus on Syrah and other Rhone varietals – the high point of their production was around 3,500 cases a year. At one point Bayard was producing Syrah, Grenache, Roussanne and Viognier (in addition to his Cabernet Sauvignon). These were among some of the better value to quality wines being produced from Napa (a limited amount of the library wines are still available for purchase through their website). Today Bayard has scaled back production significantly – and hand crafts a single wine every year, a Cabernet Sauvignon from a private vineyard in Calistoga that he has been working with for years. This wine usually has a production in the 100+ case per yer range. Renard was somewhat of an anomaly in the Napa Valley, because for many years they focused on making Syrah & select other Rhone varietals. The diversity of wines produced from non-contemporary Napa varietals was uniquely refreshing (considering two of the most common wines produced in the Napa Valley are Cabernet Sauvignon and Chardonnay). 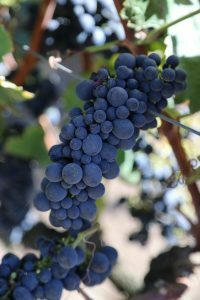 When Renard was at the height of their production, much of their fruit was sourced from hillside cooler climates in neighboring Sonoma County to the west and the Santa Ynez Valley to the south in Santa Barbara County. The 2007 Rosé Table Wine is primarily Grenache. Grenache is an interesting varietal in that it produces large amounts of fruit which for a variety of factors can have a hard time ripening evenly. This wine is clean, crisp with lively acidity and intriguing fruit including notes of watermelon and wild strawberry. The 2006 Roussanne is a weighty viscous wine that is a golden yellow in color. As Bayard describes; it has a certain “phenolic grip” or “white wine tannins”. This “waxiness” character is typical of a Roussanne and is noticeable as soon as it hits the palate; it is a wine that really shines with some food – pairing well with a variety of cheeses or fish. It is blended slightly with Viognier which brings additional aromatics to the bouquet and a hint of apricot to the palate. Stone fruit, honeycomb and a slight nuttiness are also found on the palate. The 2006 Grenache is from Sonoma County. This is a rather “big” Grenache from its voluptuous aromas to wide breadth of flavor and a plethora of spices on the palate. This is a wine with very nice acidity. 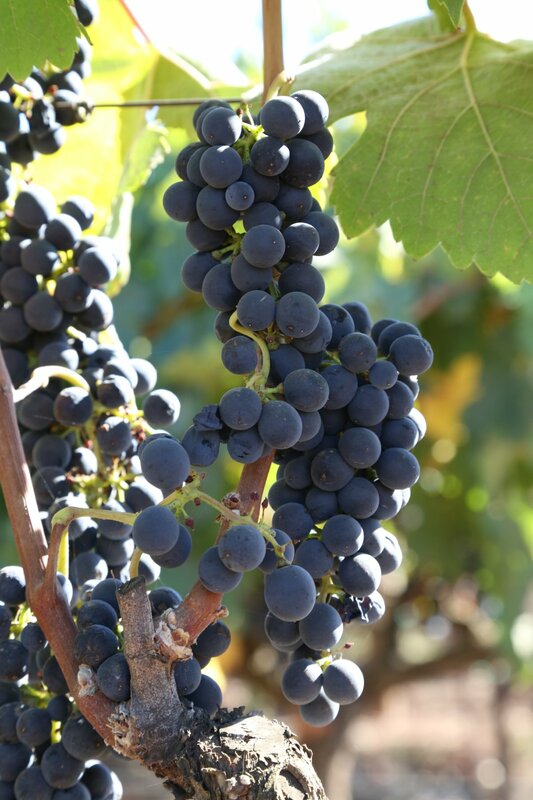 When Syrah was their specialty, Renard would produce several wines of this varietal – all sourced from unique vineyard sites carefully selected by Bayard. It is interesting to taste each wine side by side; no two are the same based on the differing terroir of the sites. Our favorite is the 2005 Renard Kick Ranch Syrah (look for the gavel on the label – the owner of the vineyard is a lawyer). 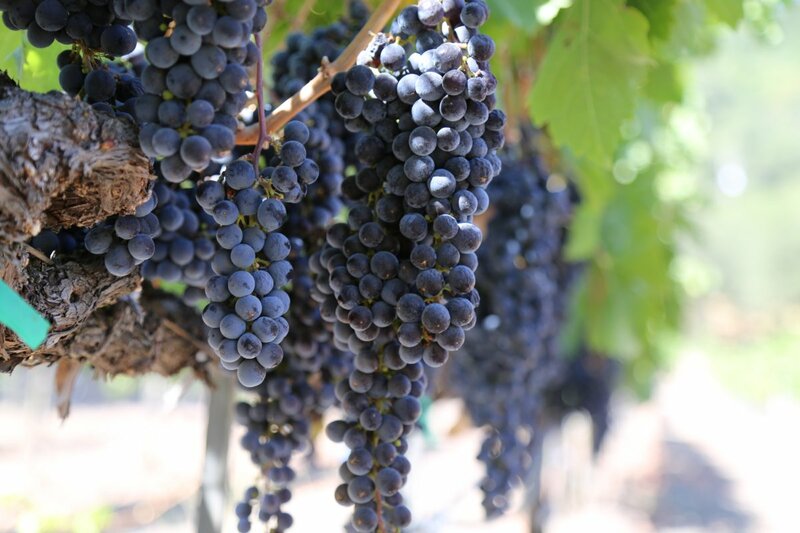 This vineyard is highly sought after – it is located in Rincon Valley of Santa Rosa in neighboring Sonoma County. This very dark inky wine is from a vineyard that sees a fair amount of summertime fog (especially in the mornings) which helps ensure a long hang time. 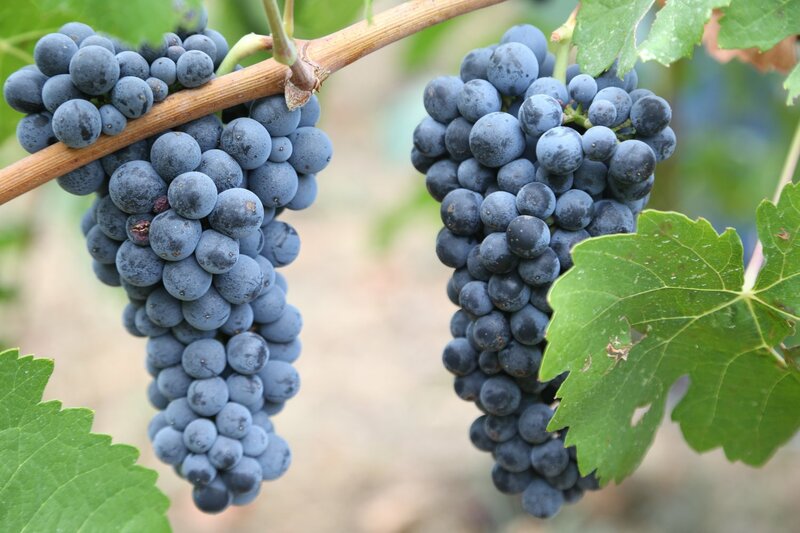 As a result the fruit is very well developed and on the palate it is rich and layered in flavor. There are two sides to this wine, the big layered fruit and an elegant side represented with elegant floral like aromas and a soft mouth feel anchored by silky tannins. Bayard continues to work with the Tres Niños Vineyard, a small vineyard located just north of Calistoga owned by well-known winemaker Elias Fernandez (long time winemaker at Shafer Vineyards) The vineyard is named after his three children who grew up helping harvest the vineyard. The 2005 Tres Niños is a predominately a Cabernet Sauvignon blend with Petite Sirah & Syrah, For the quality of the vineyard and fruit this wine is priced remarkably well. It has both structure and softness. Lots of fruit bursts to life in the nose with flavors of plum and black cherry with some herbal notes, and this ripe fruit follows right onto the palate with a touch of spiciness from the Syrah. The 2012 Tres Niños is dark crimson in the glass showing mostly darker fruit complemented by hints of oak spices and accents of cedar. But the bouquet is dominated by the fruit rather then by oak. Shows a sweetness of blackberry and a floral elegance (violets). Rounded on the entry and juicy across the palate, the wine has excellent acidity and balance. The tannins are structurally very well integrated into a seamless and smooth finish. This wine has aged exceptionally and drinks beautiful 6 years after the vintage date. The 2013 Tres Niños shows a noticeable sweetness on the bouquet, a union of both fruit (darker in nature) and bittersweet chocolate along with an unusual and intriguing nuance of honeycomb – along with a tinge of mocha. A bigger wine then the 2012 vintage, this wine features mouth watering acidity with still angular and noticeably young tannins (a result of the vintage). This wine has lots of life ahead of it. While taking their wine making and vineyard fruit sources very seriously, from their labels, you can obviously see that Renard has a sense of humor and do not take themselves too seriously. Some of their older vintages displayed tasting notes on the back label which provided general tasting note descriptions but ended with, “and blah, blah, blah”. The idea being to let consumers decide what they like and dislike rather then relying on one person’s opinion of the wine’s characteristics. 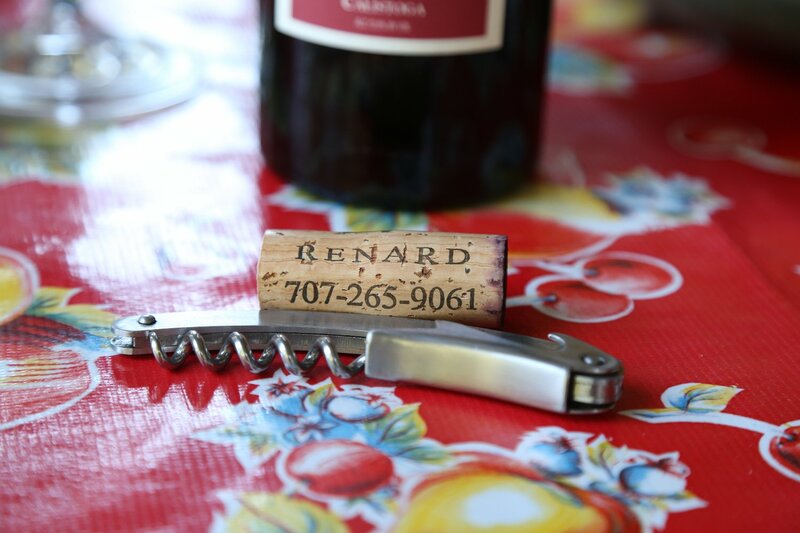 For most of their wine making years, Renard was without a tasting facility. However a number of years ago they made their wine at Silenus Vintners, a wine making and tasting collective located just south of the town of Yountville (and were offering their wines for tasting there). However they no longer make their wine here and no longer have a tasting outlet. Sharon has been worked with graphic design since 1986 having worked with numerous projects involving ad production, printed materials, logos, wine related marketing materials including labeling and websites. Her initial wine labels were for the Renard Wines – she has designed numerous other wine labels since then including screen-prints for Cuvaison’s iconic Andy Warhol labeled wines.